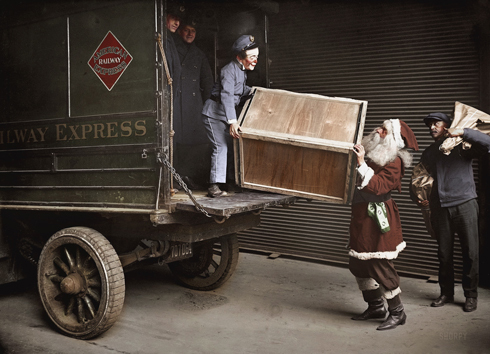 New York, December 1924. "Unloading Railway Express car." When the sleigh's in the shop, Santa might have to hijack a truck. 5x7 glass negative. View full size. Submitted by photojacker on Fri, 01/04/2013 - 5:34am. Had a go at colorizing it here. Cheers! Submitted by DrDetroit on Thu, 04/12/2012 - 7:22am. Yes, that is exactly what they are doing – delivering the Packard pedal car. Santa and the scary clown are shown in the same outfits here in Wanamaker’s Department Store in New York City. Submitted by poppypineapple on Wed, 12/29/2010 - 9:51am. I just KNOW I'll be blamed for this. Submitted by missing link on Tue, 04/07/2009 - 9:14pm. Nominate for the Scary Clowns gallery. Submitted by TuxGuys on Mon, 12/22/2008 - 11:17pm. Magic Mose & his Royal Rockers, featuring "Blind Sam," from 1984, on Arf! Arf! Records? Submitted by Bill B on Mon, 12/22/2008 - 9:29pm. The folks at Fark have "unique" minds when they work references to Schrodinger's Cat and the recently departed Bettie Page into their Farking of Shorpy's Christmas photos! Submitted by tterrace on Mon, 12/22/2008 - 6:49pm. Presumably you mean the first one, "Dead cat - maybe." Submitted by Dave on Mon, 12/22/2008 - 4:16pm. Merry Farkmas. Who can spot the entry referencing particle physics and quantum theory? Submitted by Anonymous Tipster on Thu, 12/18/2008 - 2:23pm. Do you suppose that is the Packard pedal car they are unloading? Back In The Yule S.S.R. Submitted by delworthio on Thu, 12/18/2008 - 12:23pm. Look over that guy's shoulder--somebody's getting a balalaika this Christmas! Or maybe the instruments were packaged separately from the Russian band members they hired that are in that box. Man, they had a dreadful flight. Submitted by Retread on Thu, 12/18/2008 - 11:17am. I didn't realize how many other people found clowns so creepy. So it's not just me. Submitted by sjmills on Thu, 12/18/2008 - 9:56am. I am officially freaked out. What kind of goofball thinks that a delivery man in clown makeup somehow blends with the xmas theme? And I think Santa needs to get back to eating meat, as his vegan (or bourbon) diet has left him looking remarkably un-Santa-like. Submitted by allie on Thu, 12/18/2008 - 9:54am. I'm dreaming of a noir Christmas. Submitted by JazzDad on Thu, 12/18/2008 - 9:03am. Submitted by FredPennsylvania on Thu, 12/18/2008 - 8:46am. I think it's the clown mask on the guy in the back of the truck. Creepy! Looks like they're loading UP a really bad little boy, possibly for shipment back to the North Pole to work in Santa's Secret Toy Mines until he's "reformed." The fact that there are no air holes is the crate is a bit worrisome ... but poor little Carl was really asking for it. Submitted by T.U.M. on Thu, 12/18/2008 - 8:19am. I had to chuckle - people are always commenting about how much thinner people are in general in these old pictures. Now I see that even Santa was eating a lower-fat and -sugar diet back then! Submitted by Anonymous Tipster on Thu, 12/18/2008 - 7:50am. Santa's beard is definitely the real thing, but that clown face is the thing of nightmares! Submitted by Vernon on Thu, 12/18/2008 - 7:18am. "Quit clowning around! This box of coal is heavy!" Submitted by BdgBill on Thu, 12/18/2008 - 7:16am. This is one of the creepiest photos I have seen on Shorpy. The evil clown guy on the truck is going to give me nightmares. Submitted by Mikey D. on Thu, 12/18/2008 - 7:10am. The face on the guy helping him load makes me shiver. Nightmare city. Submitted by dude on Thu, 12/18/2008 - 5:25am. ... is kinda creepy looking. Submitted by evers310 on Thu, 12/18/2008 - 5:04am. I don't know why but that little clown midget gives me the creeps!